Force Main Sync monitors hydraulics in the common force main to keep pumping at the required flow rate. 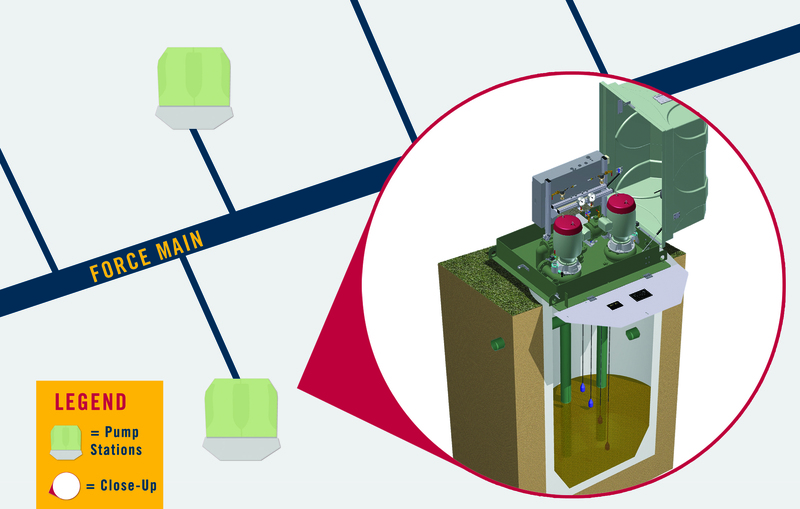 Industrial and Municipal end users and water companies are faced with problems installing multiple wastewater pump stations on a common force main. Force main pressure can be low when only one pump station is operating or much higher when multiple pump stations operate at the same time. Without accounting for the variable conditions, reduced service life and a multitude of issues arise. These phenomena result in impeller and volute erosion, reduced bearing and seal life, excessive pump noise and vibration. Conventional approaches to the problem include costly communication systems that tie all the pump stations together, oversized pumps and/or pump motors, orifice plates or partially closed discharge valves that create artificial head and prevent run-out, or flow meters and VFDs that maintain a constant flow rate regardless of head. The downside to these solutions is their tendency to be costly, bulky and complex with a loss of pumping efficiency. Smith & Loveless recently recently released a simpler solution to these issues with its Force Main Sync computer program. Force Main Sync monitors hydraulics in the common force main to keep pumping at the required flow rate. Utilizing a PLC touchscreen HMI controller, a variable frequency drive and a force main sensor, the PLC constantly senses force main pressure and automatically adjusts the VFD to maintain a constant flow rate no matter how many stations are on line. With Force Main Sync, it is easy to add a standalone pump station to a common force main with multiple pump stations already in service. The simple computer program eliminates the headaches and costs of adding elaborate communication systems, oversized pumps, installing costly flow meters or greatly increasing the possibility of clogging with a consistency in both efficient designs and flow rates.